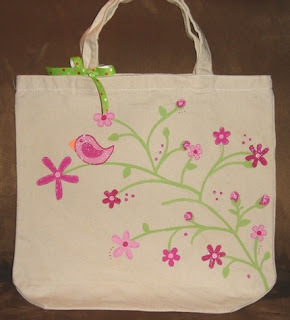 I love this adorable Cherry Blossom canvas bag from Doodle Design Shop! It features adorable pinks and greens and a perfectly simple little bird! A darling polka dot bow tops off this cute market tote! This bag would be perfect for your child to take to school, take to the library, use for church or even car trips! Your favorite teacher may want one, too! This even works as a diaper bag! Best of all, this bag can be personalized with a name for phrase, FREE! Check out all of her cute bags, aprons and personalized art on her website or etsy site! Be sure to check out her BIG sale! I'm a sucker for anything damask! When I came across this darling handmade damask pouch by Simple Sweetcakes, I knew I had to share it! Oh... a perfectly pretty pouch to pack your purse! 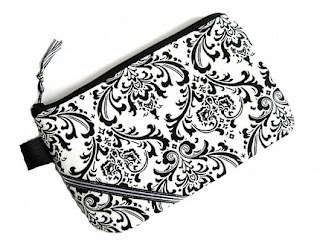 This perky pouch is made from a sophisticated black and white damask print decorator weight fabric accented with a black and white stripe satin ribbon. This pouch can help you to get organized! Perfect for holding - lip gloss, make-up, coins, cell phone, moola, ID, credit cards, camera - the ESSENTIALS! Use this pouch to help you zip out the door! This pouch will help organize that grande bag you carry!! Features include durable black and white polka dot cotton lining and zipper closure with coordinating satin ribbon zipper pull and side ribbon detail. 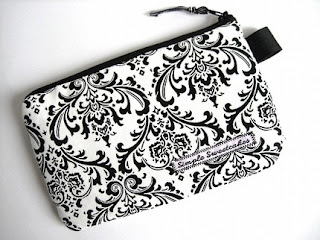 This black damask Zippy Zipper Pouch can be found at Simple Sweetcake's online store is sure to be a hit with any friend, graduate, teenager or yourself! What a sweet find! If you're like me, the task of baking a layered cake isn't always appealing, but you want the classic look of a stack of lucious layers so your guests have something sweet to sample. Fret no more! 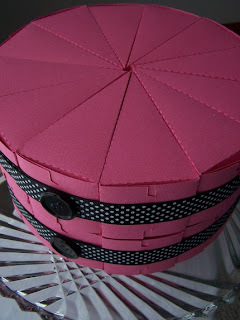 This Paper Cake from Daisys and Dots "can be made to fit any occasion! For a child's birthday party, baby shower, an open house, holiday party, bridal shower and the list could go on! You can put whatever kind of candy, snack or toy that you want inside each slice of cake!" 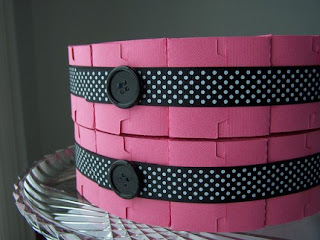 I love their "Girls Just Wanna Have Fun" Paper Cake featuring hot pink "slices" with black and white polka dot ribbon "icing detail" and black buttons! Your guests would love taking home a "slice" to savor later! Check out Daisys and Dots online at http://www.daisysanddots.etsy.com/ to order one of her darling cakes or to customize your own!